Covertex Roll Up Side Zip Outdoor Blinds are the ideal solution for weather protecting your pergola, verandah or patio. PVC Mesh Blinds offer excellent shade and cooling properties in a range of earth tone colours. 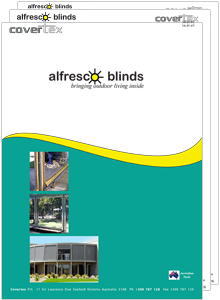 Alfresco Roll Up Side Zip Outdoor Cafe Blinds can generally be retrofitted to most pergolas without the requirement to modify the existing timber / steel structure. Blinds can be quickly extended or retracted by manual roll up or with the aid of optional blind pulley / draw chord assemblies. With the ease of double sided zips and bottom pole tensioning buckles you can easily secure your blinds with a minimum of effort. Blinds are manufactured from either 1mm PVC or high tenacity PVC coated polyester mesh to satisfy the most demanding of exposed sites. Spiral zips are to military standards and aluminium / stainless hardware ensures your investment is well protected for the long term.